A 1971 Northern Ireland Military Cross award group to Lieutenant Colonel Peter Maurice Kingston, Parachute Regiment is offered in our 20th February 2019 medal and militaria auction with an estimate of £25,000-£30,000. Peter Maurice Kingston was born on the 19th September 1932. He attended the Royal Military College, Sandhurst, and was commissioned into the Northamptonshire Regiment on 6th February 1953. He was promoted Lieutenant on 6th February 1955 and transferred to the Parachute Regiment later in 1955. On transfer to the Parachute Regiment he was posted as a Company 2IC in 3 Para, who were stationed in Cyprus and who were involved in operations against General Grivas in the Cypriot mountains around Troodos. The battalion was still in Cyprus when Nasser, the Egyptian President nationalised the Suez Canal in 1956 and 3 Para were ordered to assault El-Gamil airfield near Port Said. This was the first and last time since the end of WW2 that British forces conducted a battalion scale parachute drop into action. On 5th November 3 Para were transported in Valetta and Hastings aircraft and dropped into a small but hostile DZ with water on 2 sides. Kingston was in the lead company (A Coy) who were responsible for capturing the airfield control tower at the west end of the airfield in which they were successful and in addition knocked a bunker firing onto the DZ. Despite heavy ground fire they seized the airfield in 30 minutes and started attacking the coastal defences, in preparation for the amphibious assault the next day. During the assault, 3 Para lost 4 men killed and 3 officers and 29 men wounded. He was promoted Captain on 6th February 1959 and in 1960 he was appointed Adjutant of 17th (DLI) Bn Para. In 1962 was posted to HQ 16th Para Bde and returned to 3 Para in 1964. He was promoted Major on 6th February 1966 and commanded the Red Devils Parachute Regiment freefall display team in 1967-68. In 1974 he was appointed GS01 at Contingency Planning HQ Joint Airborne Task Force and was promoted Lieutenant Colonel on 31st December 1974. 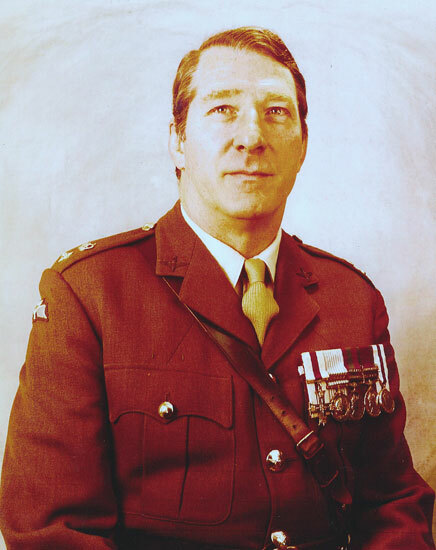 In 1975 he was CO of 10 Para (TA) Bn. He was part of the Silver Jubilee parade and marched at the head of his battalion. He had also spent periods on attachment in Bahrein and Nigeria. He was a keen Rugby player and he played for England under-16s and Richmond Park. He retired from the Army in 1981 and established a jewelry business in Yorkshire starting with 1 shop and building up to 6 shops. He died on 4th July 2014. 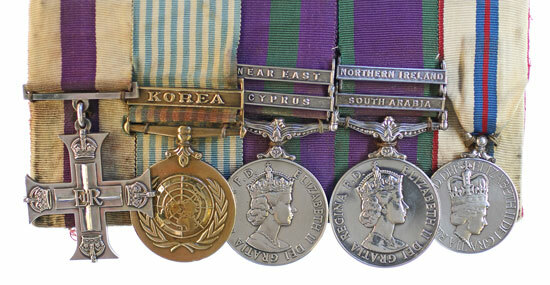 The full medal details are Military Cross (1972), 1951 UN Korea Medal, 1923 GSM 2 clasps Cyprus, Near East, 1962 GSM 2 clasps South Arabia, Northern Ireland and 1977 Silver Jubilee Medal to Lt Col P.M. Kingston Para (MC un-named as issued and dated 1972, Capt Nothamptons on 1923 GSM, Major on 1962 GSM, Korea and SJ un-named as issued) with matching set of court mounted miniatures.